Early diagnostic of mesenteric ischemia is important to avoid and decrease mortality. The initial step of treatment include assessment of the airway, breathing and circulation. Fluid replacement is considered in cases of hypotensive and dehydrated patient. However, patient may need to be nil per os ( no oral intake) and nasogastric suction is only considered to decompress the stomach and intestine. Electrolytes replacement should be started as soon as possible. Unstable patient may required intensive cardiac monitoring for dysrhythmias. Analgesic is given and urine output is monitored. Consider broad spectrum antibiotics for bowel flora such as ticarcillin, ampicillin, piperacillin, third generation cephalosporin, metronidazole, meropenem and imipenem. Patient is anticoagulated with heparin. Exploratory laparotomy is considered in case the patient develop peritoneal signs. Surgical consultation is required prior to procedure. Re vascularisation surgery is recommended. Vasodilator agent ( phosphodiesterase inhibitor) is consider to vasodilate the mesenteric via angiography catheter. Vasoconstrictor medication need to be avoided and if it is required vasoconstrictor medication should be given at lower dose. All patient with mesenteric ischemia need to be admitted and it is important to come with the diagnosis early. Increase rate of mortality may occur with late diagnosis more than 24 hours. Surgical evaluation is important prior to operative intervention. How to diagnose mesenteric ischemia? Mesenteric ischemia is diagnosed based on the history and examination ( symptoms and signs) and investigation. Differential diagnosis is important to identify mesenteric ischemia. Patient with mesenteric ischemia may complain of abdominal pain , severe and diffuse in nature as well as out of proportion. The onset of the abdominal pain is sudden . Besides that patient may present with occult GI bleeding, diarrhea, nausea and vomiting. Other than non specific signs are tachycardia, tachypnea and altered mental status. On examination, patient may present with distended abdomen and hypoactive bowel sound. Peritoneal signs may also develop. Mesenteric ischemia is suspected in patient who is more than 50 years old and complaining of unexplained abdominal pain. There are a few disorders which may mimic the presentation of mesenteric ischemia such as renal stones, peptic ulcer disease, pancreatitis, cholecystitis, perforated viscus, appendicitis, abdominal aortic aneurysm, ascending cholangitis, myocardial infarction and inflammatory bowel disease. Investigation may include full blood count.White blood cell count is elevated 90% more than 15 000. Arterial blood gases may reveal metabolic acidosis. 50% of cases may present with elevated with amylase level. Lactate and creatine phosphokinase are also elevated. Imaging technique is perform to rule out any perforation/obstruction ( flat /upright abdominal radiography). Air that present in wall of the bowel indicates pneumatosis intestinalis. Thumb printing on radiography indicates bowel edematous wall of the bowel and hemorrhagic lesions. Late finding include pneumobilia. Doppler ultrasound can be performed. Initially, the patient is asked to be nil per os( no oral intake) for 8 hours. Doppler ultrasound is useful in detecting blood flow in superior mesenteric artery . Doppler ultrasound is useful in cases of chronic mesenteric ischemia. Angiography may allow administration of fibrinolytic agent and vasodilating agent as well as visualization of the emboli in the blood vessel. Angiography may carry its own problem such as time consuming procedure, contrast agent is nephrotoxic and it is an invasive procedure. MRI is also considered as it provides images of the mesenteric vasculature. The availability and acquisition time limit it used. MRI scan can also be useful if used with angiography. Abdominal CT scan able to detect pneumatosis and edematous bowel wall. MRI scan used to be the investigation of choice. Nowadays, helical and multi detector CT scanner are the gold standard /imaging modality of choice as it is able to directly visualize the anatomy of mesenteric vasculature and the sites of occlusion. What is mesenteric ischemia? Mesenteric ischemia is associated with low flow of blood or blockage of venous or arterial system. Occlusion of the flow of blood or decrease in the flow rate of blood through mesenteric vessel may lead to infarction or ischemia of the bowel.Mesenteric ischemia mostly affect patient more than 50 years old. Patient is typically admitted due to abdominal pain and mortality is around 70%. Mesenteric artery thrombus may lead to acute mesenteric ischemia. 15% of cases are associated with superior mesenteric artery thrombosis. The thrombosis develop from the rupture of plaque from atherosclerosis disease affecting the mesenteric artery. Risk factors for developing mesenteric artery thrombus are hypertension, atherosclerotic disease and age. 80% of cases may develop into chronic mesenteric ischemia ( intestinal angina). If it is rare in other vessel. Acute mesenteric arterial embolism may cause acute mesenteric ischemia.Risk factors for the embolism are aortic dissection, aortic aneurysm, myocardial infarction, valvular heart disease and atrial fibrillation ( dysrhythmias) as well as old age more than 70 years old. Any dysrhythmias ( atrial fibrillation), ventricular thrombus and valvular lesion may lead to emboli mostly in the left ventricles and atrium. The emboli will lodge 10 cm distal to the superior mesenteric artery. 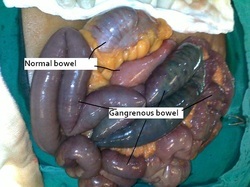 However, the flow of blood to large and small bowel are preserved. 15% cases of acute mesenteric ischemia is associated with mesenteric venous thrombosis. Risk factors of mesenteric venous thrombosis are sickle cell disease, malignancy, sepsis, pregnancy, antithrombin III deficiency , renal failure on dialysis, inflammatory condition, trauma, hypercoagulable state ( protein S and protein C deficiency as well as lupus ) and estrogen therapy. 30% of cases of acute mesenteric ischemia is associated with non occlusive mesenteric ischemia. The risk factors are use of diuretics, sepsis , congestive cardiac failure, hypotension, recent cardiac surgery, volume depletion and recent requirement of vasopressor. Non occlusive mesenteric ischemia is mostly associated with decreased in mesenteric blood flow and low cardiac output. Chronic mesenteric ischemia is also known as intestinal angina. It is presented as diffuse , post prandial abdominal pain that occur 1 hour after eating and last for 2 hours. Patient usually prefer small meal and develop food aversion to avoid pain. The causes of chronic mesenteric ischemia are extreme compression from tumors, median arcuate ligament syndrome ( compression of the superior mesenteric artery and celiac axis by the arcuate ligament of the diaphragm) , spontaneous mesenteric artery dissection and medications such as vasopressin, cocaine, pseudoephedrine , ergotamine and digitalis. 1.Rn, Kaleya, Sammartano Rj, and Boley Sj. “Aggressive Approach to Acute Mesenteric Ischemia.” The Surgical Clinics of North America 72, no. 1 (February 1992): 157–182. 2.McKinsey, James F., and Bruce L. Gewertz. “ACUTE MESENTERIC ISCHEMIA.” Surgical Clinics of North America 77, no. 2 (April 1, 1997): 307–318. doi:10.1016/S0039-6109(05)70550-8. 3.Park, Woosup M., Peter Gloviczki, Kenneth J. Cherry Jr, John W. Hallett Jr, Thomas C. Bower, Jean M. Panneton, Cathy Schleck, Duane Ilstrup, William S. Harmsen, and Audra A. Noel. “Contemporary Management of Acute Mesenteric Ischemia: Factors Associated with Survival.” Journal of Vascular Surgery 35, no. 3 (March 2002): 445–452. doi:10.1067/mva.2002.120373. 4.Sreenarasimhaiah, Jayaprakash. “Chronic Mesenteric Ischemia.” Best Practice & Research Clinical Gastroenterology 19, no. 2 (April 2005): 283–295. doi:10.1016/j.bpg.2004.11.002.